If we accept the premise that business as usual is no longer possible on a planet with finite resources, how can we encourage corporations to prepare for the future? 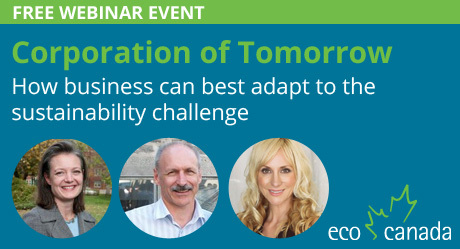 Join Stephanie Hamilton and Jim Banks, two seasoned players in the field of sustainability as they provide an overview of the emerging business models that hold the most promise in a webinar hosted by Janelle Thomlinson at Eco Canada. Stephanie Hamilton, Vice-President of Sustainable Business at EEM, and frequent collaborator, Jim Banks, Senior Consultant and Founder of the Sustainable Development Association (SDA), will discuss the most interesting recent developments, the strengths and shortcomings of the various approaches, and avenues for further reflection. Date: Wednesday October 7th, 2015 at 1:00 pm (EST). The webinar is primarily hosted for Eco Canada certified Environmental Professionals, but is also open to the public. Register for free here.